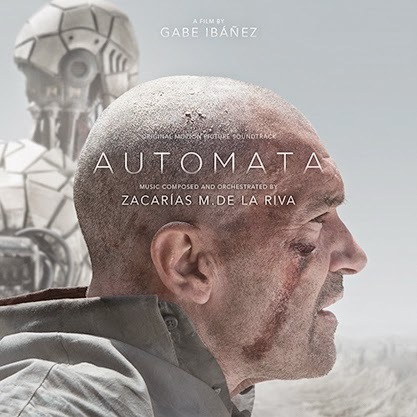 MovieScore Media releases Zacarías M. de da Riva’s soundtrack for Automata, the new sci-fi thriller starring Antonio Banderas, recently hailed by reviewers as “a strikingly slick and intriguing sci-fi thriller” (Screen Daily), “freaking magnificent” (Ain’t It Cool News), “surreal science fiction at its best” (Twitch), “smart sci-fi done on a large canvas” (Joblo) and considered a film which is “going to be looked at as a classic of the genre” (Films.com). MovieScore Media’s release of the score album co-incides with the US theatrical release of the film (courtesy of Millennium Films) on October 10. Just Announced! What I have heard I am enjoying... composer "Zacarías M. de La Riva" brings it in tight for this fantasy film from a beautiful sweep of music to gorgeous choir. It could be one of the top five scores of this year, that is something worth telling you about!